As with most developed settings, in Australia people who inject drugs (PWID) are the group at highest risk of infection and transmission; however slow disease progression means that PWID do not necessarily have the heaviest burden of HCV-related liver disease. Achieving elimination targets will involve responses among both PWID and people with advanced liver disease. We estimated the treatment scale-up required among PWID and among people with advanced liver disease, as well as the total cost and cost-effectiveness of achieving the World Health Organization incidence and mortality targets in Australia. 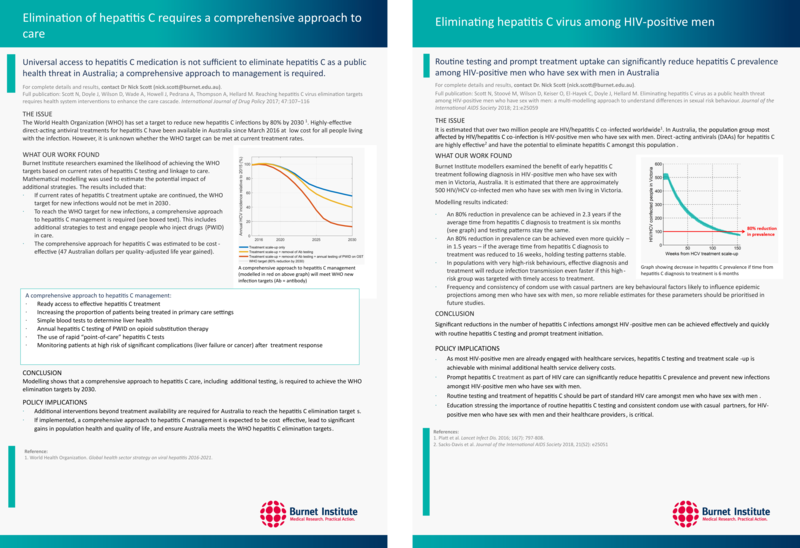 Approximately 5,700 treatment courses per year are required for patients with advanced liver disease to achieve a 65% reduction in HCV-related mortality in Australia by 2030. 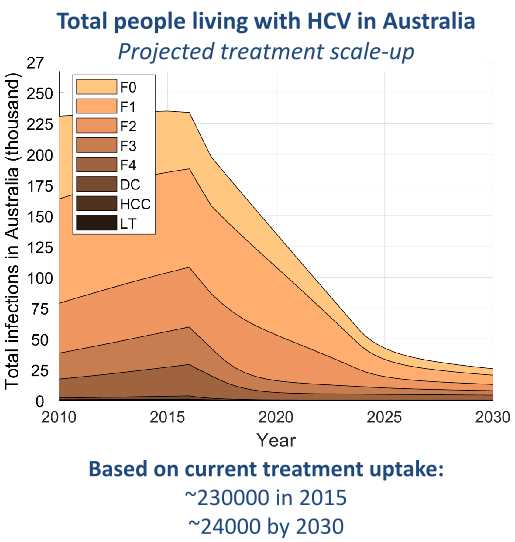 Approximately 4,700 treatment courses per year are required for HCV-infected people who inject drugs (59/1000 PWID) to achieve an 80% reduction in HCV incidence in Australia by 2030. Achieving both targets was estimated to cost AU$4.6 ($4.2-4.9) billion over 15 years; however this was also estimated to be cost-effective, with an incremental cost-effectiveness ratio of AU$25,000 ($11,000-39,000) per quality-adjusted life year gained. The Optima HCV model is currently deployed in back-end Python code and can be run by one of our modeling specialists. A front-end version is planned for release in 2019. Hellard M., Pedrana A., Howell J., Schroeder S., Scott N., Kuschel C., Wilson D.